Eddie L. Pounds focuses his practice on land use and zoning law, administrative law, government relations, and lobbying. Mr. Pounds also assists clients with general business and contractual needs. Prior to joining O’Malley, Miles, Nylen & Gilmore P.A., Mr. 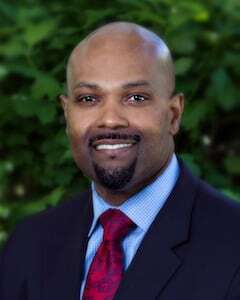 Pounds served as General Counsel for the Prince George’s County Economic Development Corporation, where, among his many other responsibilities, he kept abreast of legislative issues impacting businesses in Prince George’s County. Prior to working with the Economic Development Corporation, Mr. Pounds served in County Executive Rushern Baker’s administration as a member of the Prince George’s County Legislative Team in Annapolis, where he gained significant advocacy experience before members of the Prince George’s County House and Senate Delegations, as well as other key persons, and developed a keen understanding of the State legislative process. During his tenure, Mr. Pounds also served as an Associate County Attorney for Prince George’s County in the Government Operations Unit. Prior to joining County Executive Baker’s administration, Mr. Pounds worked as an attorney in private practice at a mid-Atlantic law firm in Maryland, where his practice focused on commercial litigation, including construction, surety and fidelity law. During that time, Mr. Pounds gained significant trial and arbitration experience before federal and state courts, the American Arbitration Association and private arbitrators. Mr. Pounds received his Bachelor of Arts in Political Science from Virginia Polytechnic Institute & State University and earned his Juris Doctor, with honors, from the University of Baltimore School of Law. During law school, Mr. Pounds worked as a judicial intern for the United States Equal Employment Opportunity Commission in Baltimore. He is admitted to practice in Maryland and the U.S. District Court for the District of Maryland. Mr. Pounds was named a “Rising Star” in 2009 by Super Lawyers. Mr. Pounds is a member of the Maryland, Prince George’s County and J. Franklyn Bourne Bar Associations. He is also active with the Greater Bowie Chamber of Commerce and Board of Trustees for Holy Trinity Episcopal Day School in Bowie, Maryland. Representing clients in Land Use and Zoning, Business Transactions and Government Relations and Lobbying. Provided legal opinions and counsel, served as a trusted advisor to the Board of Directors, President/Chief Executive officer and other C-level staff. Conducted research and analysis, prepared memoranda on specific legal questions surrounding corporate governance and employment law matters; negotiation and drafting of various legal instruments, including real estate leases, license agreements, and other loan documents; and provided legal counsel to emerging growth technology and media start-up companies. Provided legal opinions and counsel to both the County Executive and County Council on matters impacting County government, including transactional and legislative matters. Provided analyses of voter turn-out trends, implement strategies in a political campaign for the Office of the County Executive. Managed a staff of over 50 workers. Implemented a voter protection program in connection with the County Executive election and manage a team of 12 attorneys. Implemented an effective transition plan for the County Executive-Elect, leading a team of staffers designed to streamline government agencies and services. Advised and represented general contractors and subcontractors in actions ranging from single home complaints to multimillion dollar condominium and sub-development-wide claims. Representative matters included construction defect claims, construction site accident and death claims, breach of contract actions and fraud lawsuits. Drafted pleadings, dispositive motions, motions-in-limine and served as the lead in defending and taking depositions. Advised and represented clients in general civil litigation, including construction, surety and fidelity bonds and bankruptcy (creditor’s rights) matters. Provided legal research and writing in all types of motion practice and discovery issues at the State District and Circuit court levels and the Federal District Court level. Conducted extensive research and drafted legal memos regarding construction and surety law and other legal issues. Liaison between senior management and surety claim analysts concerning major trials, arbitrations, and administrative hearings. Worked closely with several Administrative Judges in writing legal opinions concerning employment discrimination disputes at the Federal level.